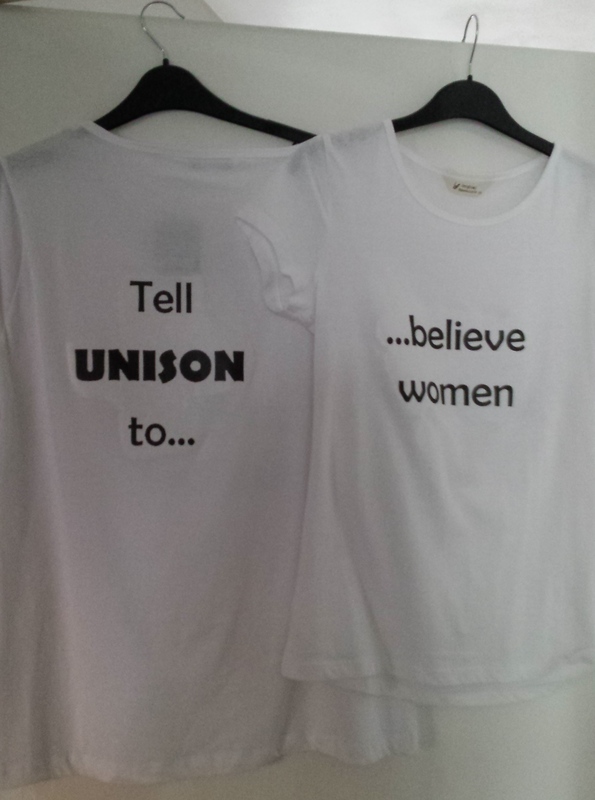 If you were following the #uNDC14 hashtag on Twitter last week you’ll have seen that despite our best efforts we didn’t manage to get the violence against women motions admitted onto the UNISON conference agenda. What we did manage to do however was ensure the issue wasn’t ignored. By anyone. I’ve put together a Storify that pretty much covers what happened – [View the story “Tell UNISON to…….” on Storify] – but I did just want to add a few more things myself. On Monday 16th those of us involved in submitting the violence against women motions to UNISON’s National Delegate Conference met with the Standing Orders Committee (SOC). We had a wide ranging discussion with them that lasted just over an hour. They then adjourned to consider the arguments we’d put to them, called us back in, and told us they were sticking by their original decision. Conference opened on the morning of Tuesday 17th, and one of the first things on the agenda was the SOC report to delegates. Part of the report dealt with the order of business for the week, and so those of us involved in submitting the motions (wearing our nice new t-shirts) challenged the report from the mic in a bid to get the SOC to reconsider its decision. Despite some of us (me) having the mic switched off on us (more than once), we managed to persuade conference to vote to ‘refer back’ the relevant section of the report, which essentially meant the committee was instructed by conference to go away and have another think about it all. Later that day we met up again with SOC and had a further discussion. They then adjourned to consider our arguments, then rang one of us to tell us they weren’t budging. On the morning of Wednesday 17th we again challenged the SOC report from the floor of conference. Sadly this time round conference voted against us, although to be fair the vote was very close and had to be taken three times before the chair could decide which way it had gone. That lunchtime 150 people, mainly women, attended a fringe meeting about violence against women. During that meeting one woman (Moira you’re a bloody star!) announced that she was going to insert the words “I’m a woman, and believe me when I say….” into one of her speeches. Everyone in the room thought it was a fantastic suggestion. No one realised she’d actually go through with it, and no one had any idea how it would take off. There were motions on the agenda that afternoon about the impact of the government’s austerity programme on women, and nearly all the speakers for those motions were women. So Moira got up and did her speech and stuck to her word about including the key phrase “I’m a woman, and believe me…”: most of the women that followed Moira then did exactly the same. Every time a speaker said “I’m a woman, believe me…” delegates in the audience clapped and cheered. That Wednesday afternoon protest was entirely unplanned, spontaneous, and completely awesome. And, dare I say it, it was also incredibly empowering. Unfortunately the UNISON leadership were not impressed. In fact they were very very cross. Which brings me to the next, more unsavoury bit. The following day we were basically told that if any more women used the word ‘believe’ in a speech their microphone would be cut off. We were also told that ‘inappropriate’ things had been said from the conference floor and on social media, and that some of us were in danger of ‘ruining the union’s great legacy.’ Because of all this, ‘the Twitter’ was being examined, as were our conference speeches, and once this was done a decision would be taken about what would happen to us next. On the Friday, the final day of conference, we were informed that ‘the evidence’ had been passed to the chair of an NEC committee, for them to make a decision on. And when I say ‘we were informed’ I mean ‘we’ as in everyone who was there. All of this was announced to conference from the chair. And as conference never went into closed session, and as it’s possible for anyone to purchase the DVDs of all our conference sessions, I’m guessing that none of this is confidential information and that I’m not disclosing anything that any decent journalist sitting in the public gallery couldn’t have picked up. Now I don’t know if I’m one of those who’s being investigated, but I’m guessing that’s the point of such public pronouncements: they serve to silence everyone. No one can be sure exactly who it is they’re talking about and which one of us is deemed to have done something wrong. Am I in trouble for my previous post about the conference for example? I don’t know. Am I in trouble for any of the tweets I posted during conference? Again, I don’t know. Will I be in trouble for writing this? Probably, but to be honest I have absolutely no idea. I do know of at least one woman who was called out of conference on the last day and then interrogated by a senior member of staff about her Twitter identity. She doesn’t actually have one, but that’s not the point. The point is I started out last week worrying that the standing orders committee of my trade union didn’t understand an issue that is of huge importance to a significant proportion of our membership, but I ended it with serious concerns yet again about how my trade union leadership chooses to deal with dissenters amongst the ranks. Yes by all means get annoyed with people who disagree with you, we’re political animals, disagreement and heated debate is what we do, it’s in our bones. But investigations, intimidation, to silence women from speaking their truth? Is this really what we want our great union legacy to be? Finally, I have to question those senior lay activists and staff who claimed that women had ‘hijacked’ conference. The UNISON membership is nearly 80% women, so how it’s possible for us to hijack our own conference I don’t know. The fact that it’s seen as hijacking when women talk about issues of importance to women at a majority women conference does tell us we’ve still got a bloody long way to go though. Typical male behaviour – intimidating women and attempting to silence any debate when the issue is about women and not men!! News flash UNISON is 80% female. But as usual the men in charge believe they have right to intimidate and threaten women because women must not have a voice and they can only speak when men say they can. Typical male reversal claims because it is the men who have attempted to hijack this conference! I didn’t know UNISON is now a small scale male owned autocracy wherein men in charge (sic) have right to intimidate and threaten women members. Good take on the whole sorry episode at the NDC. One point though, the SOC doesn’t have to “understand” the importance of issues to “allow” it to go on the agenda. It should leave it to the conference to decide. But with the mic being switched off and speeches being interrupted so frequently by the chair, how could the conference make an informed decision? It was really not explained by SOC how the motion was allowed to be discussed at other unison forums and not at NDC and if, according to SOC, the discussion of the subject could put our union in legal jeopardy, then what’s the legal advise on how to deal with this situation where the motion is passed at Women’s conference. As Worker’s Liberty puts it: “Legal jeopardy has been used for many years to silence key debates at conference against the left, but this year against National Women’s Conference, Eastern Region and National Women’s Committee.